(Photo: REUTERS / Thomas Mukoya)Rev. 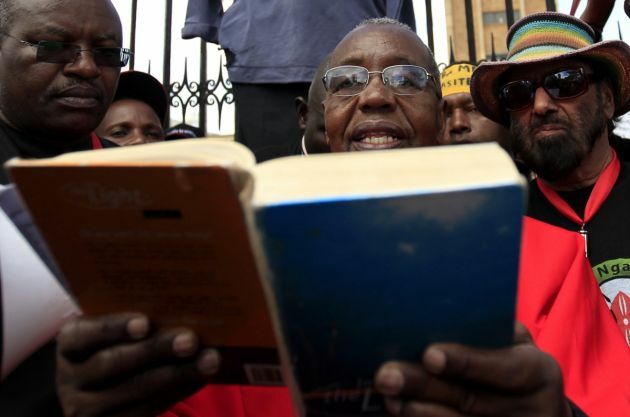 Timothy Njoya, an advocate for justice and human rights, reads the Bible at the Parliament gate during a demonstration against the legislators plan to receive higher bonuses in the capital Nairobi, January 14, 2013. Kenya's president rejected plans by members of parliament to triple their end-of-term bonuses and award themselves diplomatic passports, bodyguards for life and state funerals. In their last act before parliament closed for March 4 elections, Kenyan lawmakers, already among the best paid in the world, tried for a second time in a few months to increase their end-term bonus to 9.3 million shillings (7,200) each. Kenyan professor John Mbiti has recently become the first African scholar to translate the entire Christian New Testament from Greek to Kikamba, a language, spoken by a minority of Kenyans. The translation, titled The Kikamba Bible - Utianiyo Mweu Wa Mwiyai Yesu Kilisto (the New Testament of the Lord Jesus Christ), was launched in December by the Kenya Literature Bureau, the World Council of Churches says in a statement. Theologian Mbiti is former director of the Ecumenical Institute of Bossey of the World Council of Churches in Switzerland and is an Anglican priest. A New Testament scholar, he has authored various publications on religion and ecumenism. Mbiti's works include Bible and Theology in African Christianity, New Testament Eschatology in an African Background, African Religions and Philosophy and The Prayers of African Religion. Originally from the Kikamba -speaking community of Kenya, Mbiti studied in Uganda, the United Kingdom and the United States, earning his doctorate in 1963 from the University of Cambridge, UK. He also taught religion and theology at the Makerere University in Uganda. Mbiti served as director of the Ecumenical Institute at Bossey, Switzerland from 1974 to 1980. The New Testament as translated by Mbiti will be used in primary schools of Kitui, Machakos and Makueni, and will enable many in the Kamba community to read and understand the gospel. In the past, Bibles were mostly translated by foreigners or teams led by them into the nearly 770 African languages, mainly starting from editions in colonial European languages. Mbiti's translation makes one of the rare translations sourced from Greek, the original language of the New Testament. Willy Mutunga, chief justice and president of the Supreme Court of Kenya said Mbiti has collected about 1500 short stories, and published some of them in English, while the rest remain in handwritten manuscripts. "That way, he has shown that Kiikamba is a strongly narrative language. When he was a schoolboy he wrote a novel called Mutunga Na Ngewa Yake (Mutunga and his Story), published by the (then) East African Literature Bureau, Nairobi 1954. "That book is still being used in schools, and the Kenya Literature Bureau has issued a second edition," said Mutunga. Mbiti has written a longer sequence to his first novel, Weteelete Ndakusaa (The one waiting does not die, Nairobi 2012), which he is currently translating into English. There are few other authors who have written or collected stories in Kikamba.